This Saturday 2/23 ABATE of Washington will be having a legislative update with question and answer session at Owens HD in Yakima 11am to 2pm. ABATE is running 6 bills this year including, weight fee, motorcycle parking, lane splitting, profiling, helmet choice & vulnerable users. 1) Who is going to present at the meeting? Will it be a motorcyclist ABATE member, or a legislator / legislative aid? 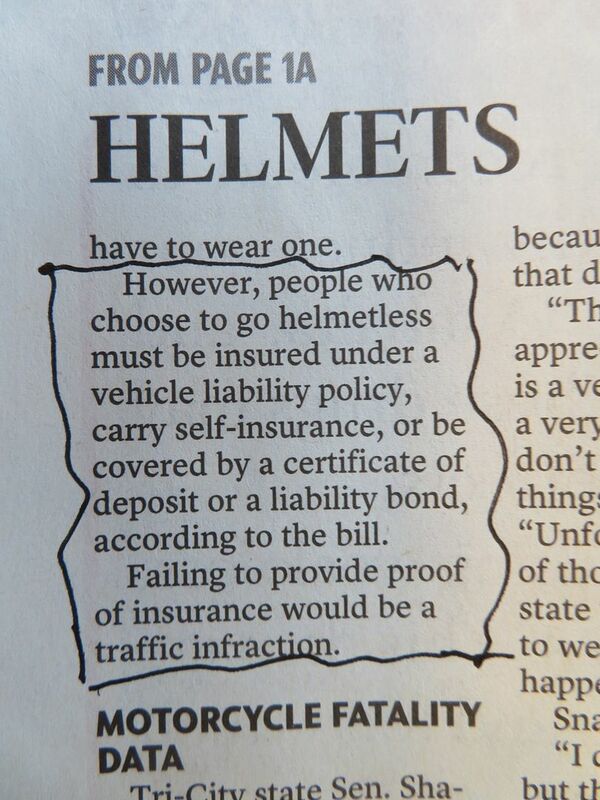 2) Below is how the TriCity Herald newspaper reported on the "Helmet Choices" bill, as you call it. A page 1 story on a Sunday. Now isn't this right? --> the bill attempts to sneak in mandatory liability insurance for motorcycles by hiding it inside a freedom bill. Liability insurance covers others whom you hit / injury if they aren't on the bike. Insurance biggee State Farm does not offer rider injury protection policies, I've checked. Injury protection coverage for helmet-less riders apparently isn't the subject of the proposed bill. Seems: Bait and Switch - your ABATE organization needs to remove this liability insurance requirement from the proposed bill..
Helmetless riding is a public safety hazard: brains on the pavement are even slipperier than wet leaves. HB 1014 takes care of the insurance issue with motorcyclist. Law or no law, I’ll always ride with a helmet. I’ve taken rocks to the shield that were kicked up by oncoming traffic and witnessed Devin getting his shield broken due to bird impact. Many such situations without a helmet would have very different outcomes, which could easily include ending up in the oncoming lane. HB1014 was authored by Rep Jenkin of the 16th District, Benton, Walla Walla, Columbia counties. As he told me it was presented as a result of motorcyclists being at fault for accidents and being uninsured. Washington is the only state, as I understand it, that doesn't require insurance on motorcycles. 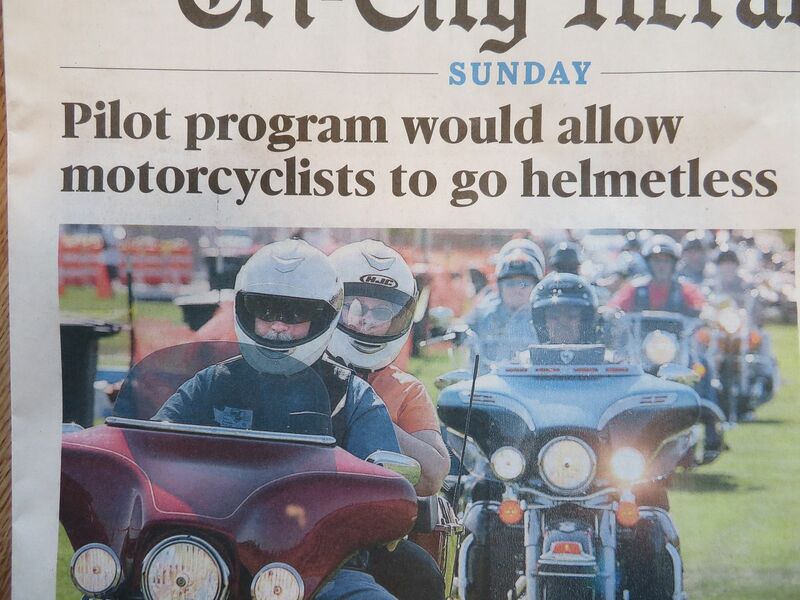 This has nothing to do with the helmet choice bill, HB1125. The helmet choice bill is choice only, if you would choose to ride without one you would be required to carry medical insurance to cover your medical expenses. This bill also has a sunset...3yrs, extension of the bill will be determined by study done to determine if fatalities increase or decrease. As to the Owens thing, that will done by members of ABATE presenting the status of the bills currently before the legislature. If you have issues with mandatory insurance for motorcycles you need to get a move on. It has already passed the House and is now in the Senate, so contact your Senator if you don't want (or do) the bill to pass. Sorry, HB1125 has to do with limiting the number of retail licenses for MJ sales. The bill itself consists of small language changes mostly to specify that the rules set out apply to those under the age of 21. Wish they could throw something in to the effect of accepting ECE certification, not just DOT. You can pick nits about which certification is better in which detail, but both meet the goal of getting useless helmets off the street, and all ECE helmet models are independently tested by a third party, a process that's much more thorough than DOT's. What I linked above is the Senate version (presumably identical at this point). you know, we are already required to have "health" insurance that pays for doctors visits etc why do we have to have separate insurance that.....pays for doctors visits etc? i note that ABATE is holding their thingy in Yakawalla and not in Seattle. Is this the shock and awe bill to make the lane splitting bill look sane? There is no longer a federal health insurance mandate. That was eliminated very early in the current administration's tenure.